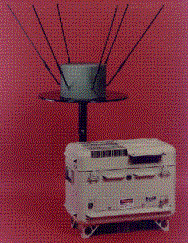 The SHORTSTOP system was originally produced as a Quick Reaction Capability (QRC) product in support of Desert Storm. Whittaker Corp. in Simi Valley, CA built the system for PEO-IEW during the Gulf War in response to the artillery threat posed by the Iraqis, but the war ended before Shortstop could be deployed. The system could reduce casualties to ground troops by as much as 50 percent during the initial stages of an enemy attack. A request for information (RFI) was received from ARCENT addressing available countermeasures for indireWhile Shortstop defeats proximity fuzes, weapons with impact fuzes are able to slip through the systems' defenses. But the manufacturer, Whittaker Corp. in Simi Valley, Calif., said the system could reduce casualties to ground troops by as much as 50 percent during the initial stages of an enemy attack. These prototype systems were subjected to a minimal amount of environmental testing in preparation for deployment. After Desert Storm, the system was subjected to extensive live fire testing in the desert at Yuma Proving Grounds and evaluated by the TRADOC Analysis Command (TRAC) and the Dismounted Battlespace Battle Lab. The SHORTSTOP, AN/VLQ -9 or -10, systems demonstrated, in testing, the ability to significantly enhance survivability of troops and high value assets from indirect fire, proximity fuzed munitions. Reports of more than 5,000 live artillery and mortar round firings against Shortstop in tests at Yuma Proving Ground, Ariz., indicate that the system is 100 percent effective against selected weapons. The test rounds were fired singly and in barrages, with none reaching their intended target, test officials reported. The prototypes were deployed for a limited period of time in Bosnia and were returned to contingency stock in 1997. To meet urgent operational requirements for deployed forces, the 3rd Army Commander on 11 Feb 98 requested 12 Shortstop Electronic Countermeasure Systems. These systems were readily available as a near term loan that only required funding to train operators and purchase some fielding and maintenance related items. HQDA approved the release for immediate deployment, requesting AMC execute the action that was subsequently completed by CECOM's Project Manager for Firefinder. The QRO supported delivery and fielding of these systems by coordinating the necessary arrangements for deployment of a two-man New Equipment Training Team (NETT) from CECOM. The NETT departed on 25 Feb 1998 with the equipment (acting as couriers) on a C-5 Cargo flight out of Dover AFB. The SHORTSTOP system training, checkout and positioning was completed by the CECOM NETT 20 March 1998. In July 1999 the House Armed Services Committee appropriated $4 million of the defense budget for the Marine Corps to purchase a counterartillery system known as the Shortstop Electronic Protection System. The system, first fielded during Operation Desert Storm in Southwest Asia, provides protection from incoming mortar, artillery, and rocket shells by detecting incoming rounds. On August 27, 1999 Condor Systems was awarded a $8,513,414 (base year total) contract as part of a $25,000,000 (total if all options are exercised) firm-fixed-price and time and materials contract for 40 Shortstop Electronic Protection Systems (SEPS). Work will be performed in Simi Valley, Calif., and was expected to be completed by Dec. 31, 2001. In 2001 the National Guard Bureau established requirements for Shortstop systems for the Army National Guard. A congressional Plus-up from the Fy01 Supplemental enabled 18 Shortstop to be delivered to the ARNG. The first systems fielded were to the Pennsylvania ARNG for their rotation to Bosnia and to the 20th Special Forces for their support in Enduring Freedom. Subsequently systems have been fielded to South Carolina, Indiana and Minnesota. Packaged in a suitcase-size case and fitted with a small multi-directional antenna, the Shortstop system can be activated and operational within seconds. Shortstop's passive electronics and operational features make it impervious to detection by enemy signal-intelligence sensors. In the near future, Shortstop will shrink in size, down to 25 pounds. Whittaker is currently under contract to build three new, smaller versions: manpack and vehicle units, as well as a stand-alone unit. The Shortstop Electronic Protection System (SEPS) is a portable radio frequency jammer installed on vehicles in Iraq. The SEPS could be programmed to jam a specific range of frequencies. SEPS were also placed at ECPs in order to defeat any remotely controlled VBIED or suicide bomber wearing explosives. The Shortstop Electronic Protection System is a mobile electronic countermeasure systems managed by the Fort Monmouth-based Product Manager for Firefinder were deployed with ground units to protect personnel and equipment. The Shortstop system decoys enemy artillery, mortars and rockets causing them to detonate before reaching their intended targets. The Warlock Force Protection System is a lifesaving countermeasure. Warlock has been effective in countering the threat of improvised explosive devices, such as those being used by terrorists in Iraq and Afghanistan. The Warlock devices are modified versions of EDO's battle-proven "Shortstop" electronic protection system. Warlock Green emits a radio frequency to jam communications signals that detonate improvised explosive devices. EDO also manufactures a less sophisticated jammer called Warlock Red. Originally designed to defeat proximity fused indirect fire munitions, Warlock has a dual capability to deny the use of enemy modern communication devices. Warlock can be used individually or in groups to provide wide area coverage without mutual interference. The systems have three configurations-man-pack, vehicle mounted, and stand-alone. The Army and EDO have been working on a fast-track procurement effort since November 2003 to increase and accelerate the production of Warlock units. Under this contract, the Army has ordered EDO to deliver more than 1,000 additional Warlock units in two versions. Warlock Red is a low-cost jammer to counter specific threats that have been emerging in increasing numbers. Warlock Green is a more capable jammer used to address more sophisticated threat systems. EDO expects most of the units ordered under this contract to be delivered in 2004. The ARNG is currently at a high deployment rate and anticipates a continued high OPTEMPO. ARNG soldiers are deployed in theaters of operation where the enemy uses proximity fuses and booby traps. Not funding this program will put National Guard troops at a higher risk when the capability exist to increase the level of force protection that is afforded to the Active Component soldiers. Warlock has become a lifesaving system that provides techniques to deny unfriendly use of modern communication devices used in booby traps. On 18 December 2003 EDO Communication and Countermeasures, Simi, Valley, Calif., was awarded on Dec. 17, 2003, a $15,923,908 firm-fixed-price contract for 167 Warlock Greens and 1000 Warlock Reds for Operation Enduring Freedom/Operation Iraqi Freedom. Work will be performed in Simi Valley, Calif., and is expected to be completed by Jan. 31, 2005. Contract funds will not expire at the end of the current fiscal year. This was a sole source contract initiated on Nov. 24, 2003. The U.S. Army Communications-Electronics Command, Fort Monmouth, N.J., is the contracting activity (W15P7T-04-C-L001). On 01 March 2004 EDO Communication and Countermeasures, Simi Valley, Calif., was awarded on Feb. 27, 2004, a $6,753,000 increment as part of a $45,287,633 firm-fixed-price contract for 132 Warlock Green electronic countermeasure devices. Work will be performed in Simi Valley, Calif., and is expected to be completed by Jan. 31, 2006. Contract funds will not expire at the end of the current fiscal year. This was a sole-source contract initiated on Nov. 24, 2003. The U.S. Army Communications-Electronics Command, Fort Monmouth, N.J., is the contracting activity (W15P7T-04-C-L001). On 30 November 2004 EDO Communications and Countermeasures, Westlake Village, Calif., was awarded on Nov. 29, 2004, a $7,911,400 modification to a firm fixed price contract for 100 Warlock Green and 500 Warlock Red Electronic Countermeasure Devices. Work will be performed in Simi Valley, Calif., and is expected to be completed by May 30, 2005. Contract funds will not expire at the end of the current fiscal year. The U.S. Army Communications-Electronics Command, Fort Monmouth, N.J., is the contracting activity (W15P7T-04-C-L001).